The National University of Singapore (NUS) has been ranked the top university in Asia by the London-based Times Higher Education magazine for the second year in a row since the introduction of the category in 2013. It beat second-place Peking University and third-place Tsinghua University - both in China - in the latest Asia University Rankings 2017, published online early yesterday morning. 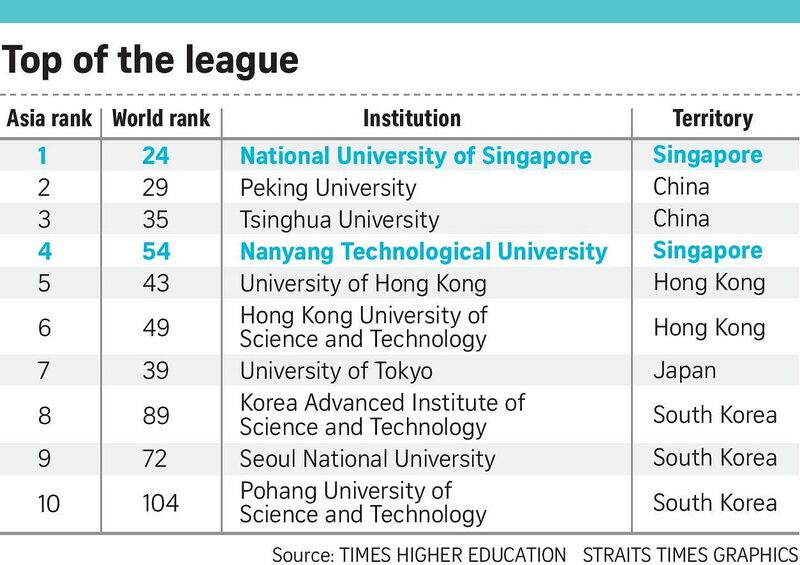 Singapore's Nanyang Technological University (NTU) was ranked fourth, followed by the University of Hong Kong in fifth place. NTU slipped from the No. 2 spot, even though its overall score improved. The Times Higher Education Asia University Rankings is a ranking of Asia's best 300 universities from 24 places, including Japan, South Korea, India and Israel. It uses 13 performance indicators - such as research performance, teaching environment and research citations - to rank the universities. NUS president Tan Chorh Chuan said: "We are pleased that NUS has once again been recognised as Asia's leading university in the latest rankings by the Times Higher Education. "This is a strong recognition of our Asian and global approach to education and research, as well as the importance we place on making a positive impact on the nation and the community around us." Professor Tan added that NUS will strive to ensure that its education and research remain innovative and relevant to Singapore and the region. NTU president Bertil Andersson said of his university's achievement: "The competition is, of course, much keener when you are at the top, with many similarly dynamic and ambitious Asian universities putting up a strong fight. Some fluctuations each year are not unexpected when you are in the top league. "I'm happy that NTU has performed better and has higher scores compared to last year. Compared to two years ago, when we were placed 10th, we have made big strides up in the rankings, although not as much as last year." The editor of the Times Higher Education Rankings, Mr Phil Baty, congratulated NUS on retaining its position as Asia's top university for the second consecutive year despite "very tough competition" from Peking University and Tsinghua. He said: "I predicted several years ago that NUS would reach the top, and the university really has established itself as the role model for the entire continent - demonstrating that with decisive leadership, a truly international approach and with the backing of government prepared to invest in higher education, Asian universities can legitimately challenge the traditional Western elites of the US and the UK."